In 1606, all initial VOC shareholders were given deposit receipts as proof of their capital contribution. These documents are known as the oldest shares in the world. 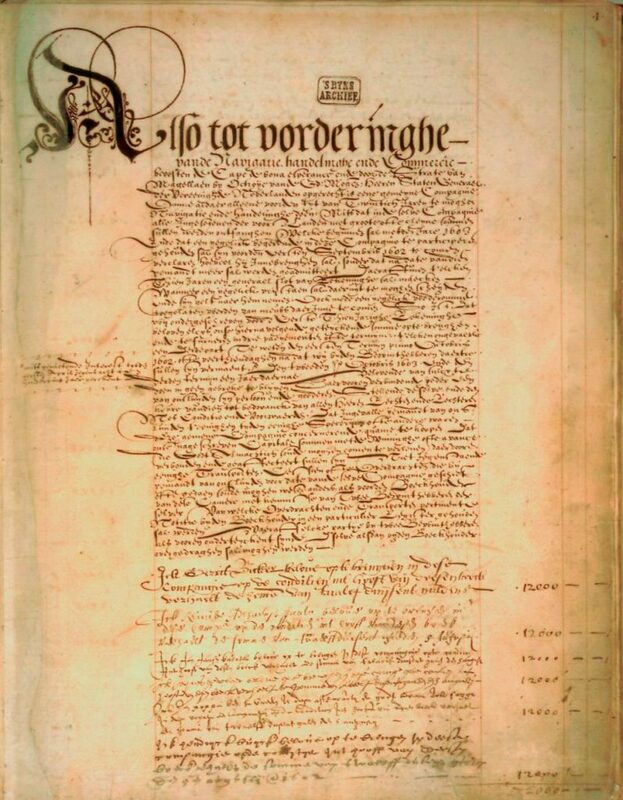 First page from the oldest capital book of the VOC chamber of Amsterdam. This book contains the names of each of the first 1143 VOC shareholders in Amsterdam, as well as the amount they contributed. 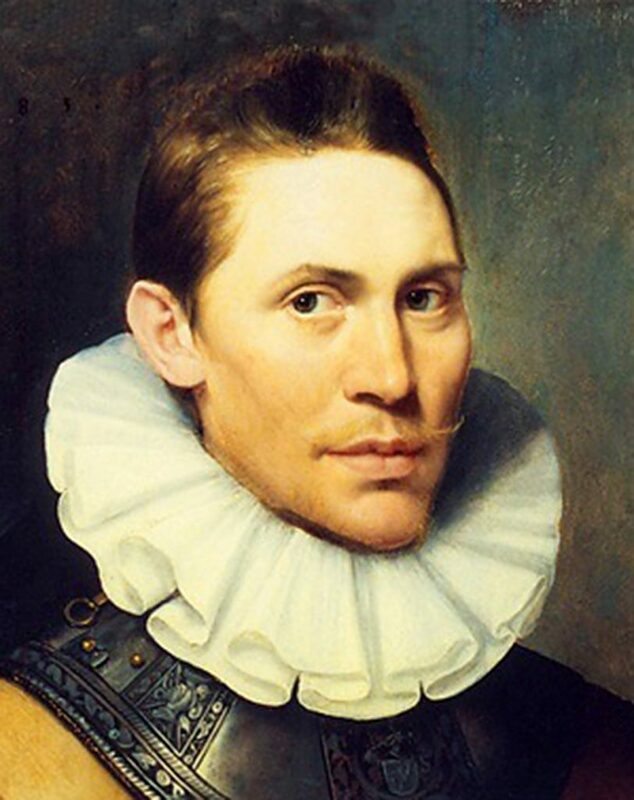 Portrait of Dirck van Os (1556-1615), co-founder, large shareholder, and director of the VOC. Like many other people who were involved in the formation of the VOC, he was originally from Antwerp. View of Amsterdam, as seen from the IJ. Left of the center is the Nieuwe Brug (New Bridge) with the ‘Paalhuisje,’ where the first VOC documents were traded in the early 17th century. 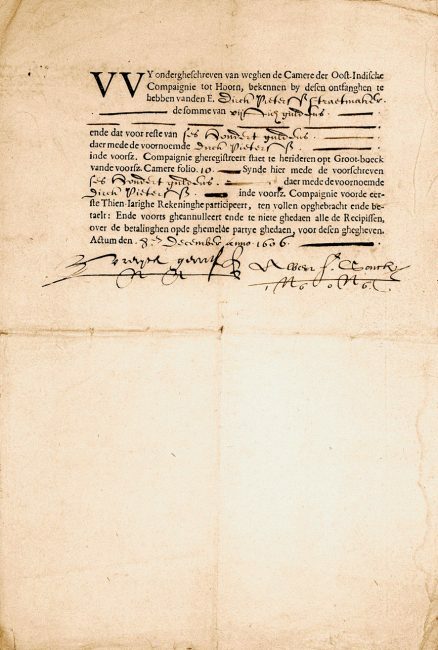 The Dutch East India Company (VOC), established in 1602, was the first company in the world to issue shares to a broad audience. Before the rise of the VOC, a limited group of moneylenders was already able to participate in the financing of a single sea voyage. Whenever the voyage was successful, the investors subsequently shared in the profits, but whenever the journey ended in failure, they had lost their money. The VOC for the very first time enabled investors from all strata of the population to invest in a company that intended to continue to exist for many years and that already had a lot of the features of a modern public limited company. Trade in VOC shares grew rapidly. With the first issue, the VOC brought in 6.5 million guilders, and the company subsequently grew to become the first multinational in the world. In 1606, the increase in value of the shares was already at 200%. In 1610, the company paid out dividend for the first time. 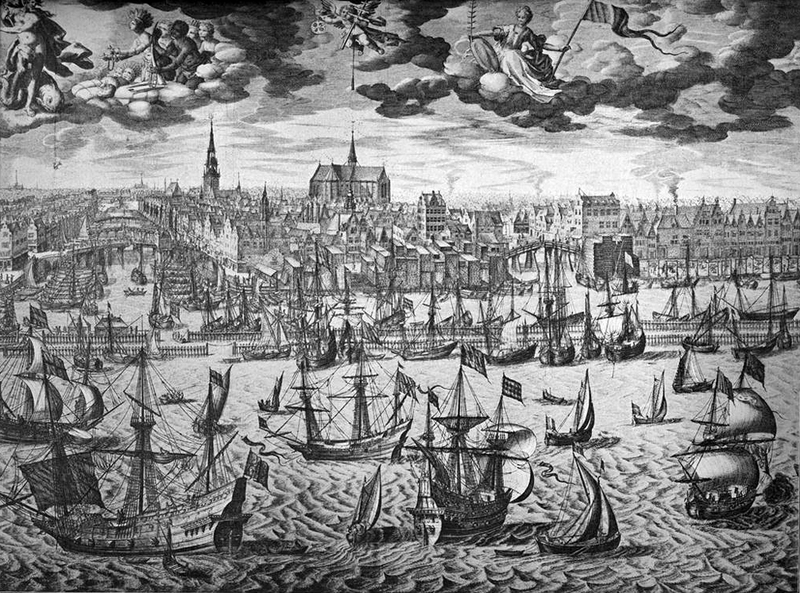 Soon after the ‘initial public offering,’ a thriving trade grew up, and Amsterdam developed itself as the cradle of global share trading. The issuance of tradable shares entailed a revolutionary development in 17th-century life. Investors were able to sell their shares and get their money back, while the participation amount still remained in the company. The VOC literally succeeded in turning 1 guilder into 2 guilders. It is not surprising that other companies, both domestic and abroad, soon followed suit. Governments, too, discovered the benefits of the public capital market. The VOC continued to exist for almost 200 years. In 1799, it was effectively abolished. Because of the global popularity of initial public offerings that has existed ever since, the VOC is, in a sense, still very much alive!